Voya makes the lifes of travel managers, travelers and even the accounting department so much easier. 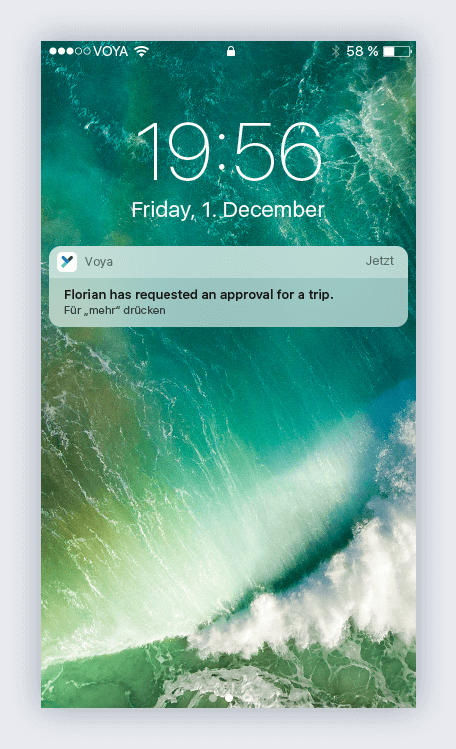 From guideline management up to accounting; Voya takes care of all processes in your travel management and even saves money and time every step along the way. We created a booking process for the traveler we created a booking process as simple as texting a friend. In order to set up your account and the correct guidelines for using it, your personal account manager is available for you at all times. Regardless if it’s a matter of the traveler, or the integration into an existing accounting solution: Every step is so easy to set up, that even in large corporations Voya can be up and running in a matter of days. Via our web interface, the travel manager is able to monitor and review every booked trip. Additionally, it allows you to configure allowance processes and real-time reporting. Thus, the company or travel manager has total control over all processes, at all times. By using the Voya Chat service, you can directly get in contact with our travel professionals. We are taking care of your requests, at all times. With Voya you are able to request a travel inquiry any time. We will get back to you with the best options promptly. Your preference can then be selected with only one click. 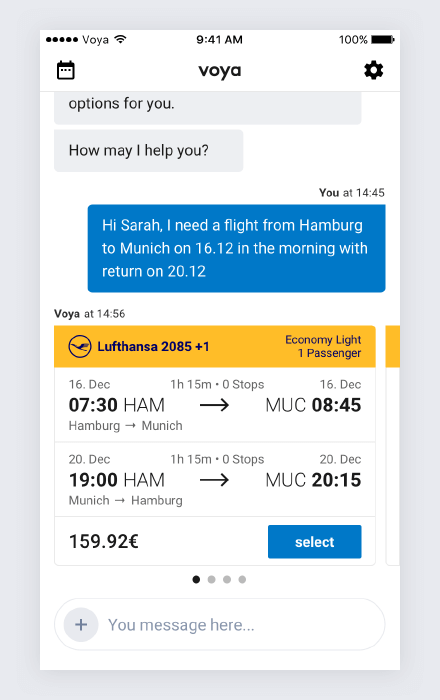 If desired, every employee can request and book individual travel options on the desktop or app version by simply using Voya's express or chat feature. This results in being able to significantly reduce the coordination efforts between the traveler and internal travel management. For the travel manager we offer a platform on which journeys for others can be easily requested and directly booked. The best part: The schedule is directly synchronized with the traveler himself. Generally, we only suggest options that are in line with the travel guidelines set by the company itself. If due to certain circumstances these boundaries need to be extended, the assigned approver can authorize the booking with one click. Request a journey on the computer in your office and choose the best option on your smartphone while you are on the move: This is only possible due to complete synchronization on all platforms. All travel schedules are thus shared and synchronized with the traveler as well as the travel management. Every employee can store their preferred seat and loyalty programs in his or her personal profile. These are taken into consideration for every booking. Our algorithmic technology is able to learn from every booking made and thus allows us to book an even better and faster option for you the next time you travel. If possible, Voya tries to check-in every traveler on their preferred seat. 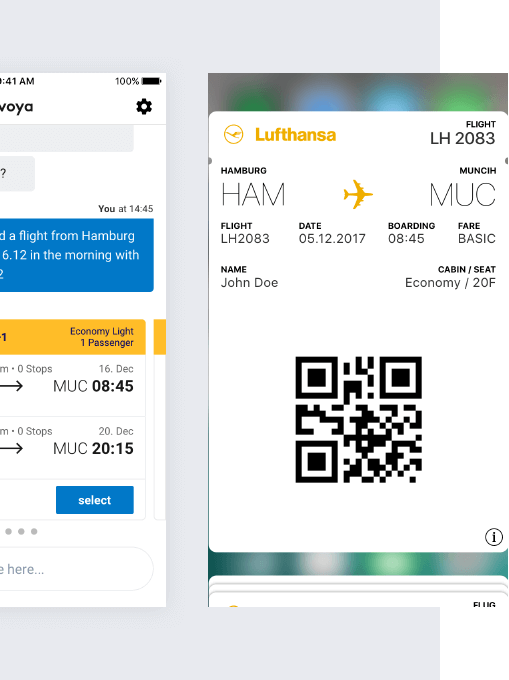 A boarding pass is then directly sent to the traveler’s smartphone. Regardless if booking a rental car, hotel or flight: Voya pays all bills in advance, enabling the traveler to have carefree and relaxed trip. The appointment iss taking longer than expected? 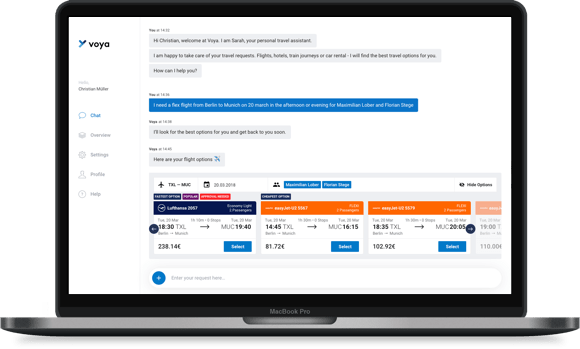 No problem: Within a matter of moments the traveler or travel manager can re-book or cancel existing bookings via chat. Emergencies, bad weather or upcoming strike: Voya coordinates all re-bookings and, if necessary, immediately flies out all customers in potentially dangerous situations. At all times, you chat with experienced travel professionals. We take care of any concerns regarding your bookings and make sure that the entire trip is most comfortable. Every booking can be reviewed and monitored on our web-based dashboard in real time. 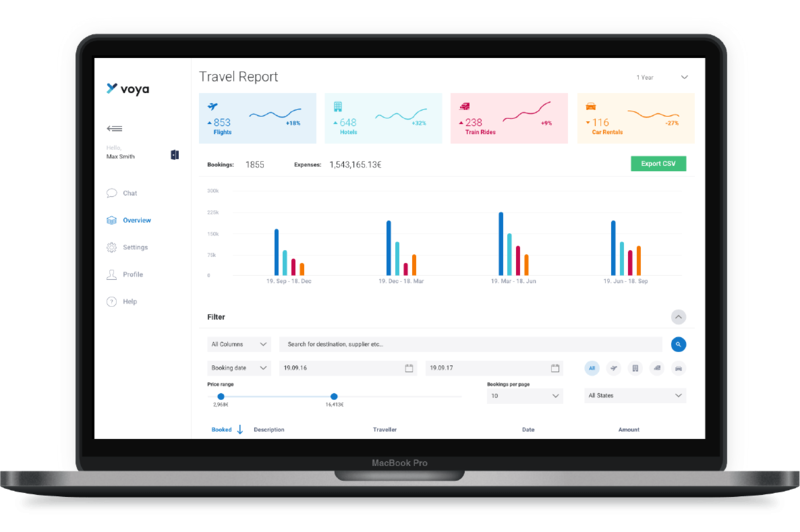 This gives the travel manager an overview of the travel status and whereabouts of every employee. In the admin tool, you can gain insight into all past and future journeys. It also allows you to select and sort all bookings according to cost center, project codes, traveler and travel destination. You can comfortably export a .csv file of all journeys and relevant information for time frames of your choice. Voya simplifies the billing process of every booking by processing all invoices. When billing via AirPlus, Voya issues a receipt for every booking. Voya pays all journeys in advance. By doing this, the traveler does not have to take care of paying bills on site and your accounting department only has to settle one account. If desired, Voya helps you optimize your cash flow, and finances all bookings and services for a time span of 14 days. All fees are then compiled and issued in a structured overview. You'll be glad to hear that Voya can be perfectly integrated in your current AirPlus solution. We are able to bill every booking via AirPlus and issue a receipt accordingly. If desired, Voya can ask for a cost center and a project code for every booking made. These are then remitted back onto the invoice and can also be seen in the the dashboard. Voya cooporates with the biggest travel expense and settlement systems like AirPlus, MobileXpense and HRWorks and thus offers a seamless integration into your existing tools. For further information leave us your phone number and we will get back to you as soon as possible.